22 inch wide by 24 inch long by 25 inch deep infeed hopper. 22 inch wide stainless steel block lift / chute with 34 inch infeed height, with hydraulic lift cylinder. 25 HP 3 phase chain drive motor. All sanitary stainless steel product contact surfaces with painted steel frame and gearbox. 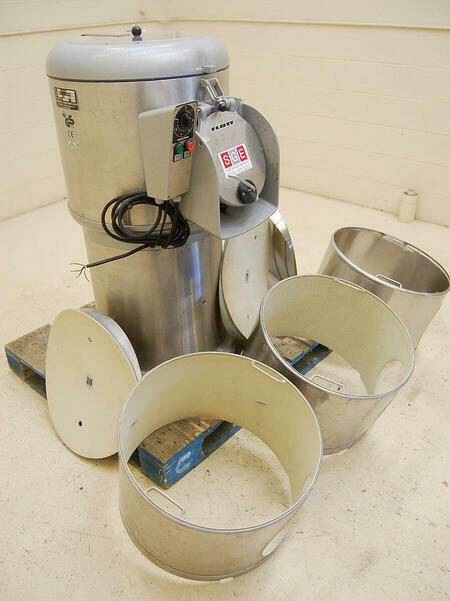 As of this writing, this Rietz Bepex EXTRUCTOR is in stock at ALARD, in good mechanical condition, available as-is for immediate shipment without a discharge plate; --OR can be serviced by our shop and completed to buyer specification by our shop for a timely shipment. CALL 315-589-4511 to confirm availability and discuss your industrial food process cutting, grinding, pulverizing & particle reduction size needs. Manufacturer rated for filling up to 10 lbs. per fill and accurate to .01 lb (.01 kg). Programmable "bulk & dribble" control system integrated with vibrating linear scale net-weighing system. 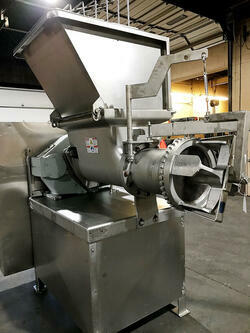 Product is fed to the filler via a 24 inch square by 20 inch deep hopper at 68 inch high infeed. 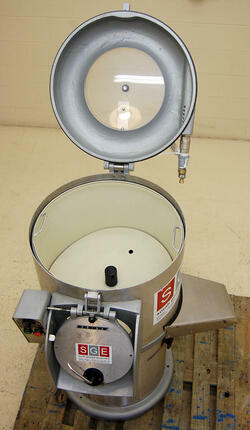 The hopper feeds, via a sliding gate, to a vibrating even-feed pan that discharges to the weigh cell. 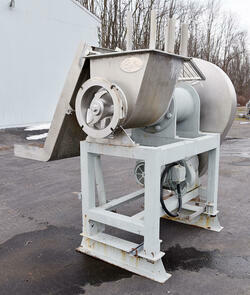 This vibratory feeder modulates between high "bulk" and low "dribble" modes, for speed and accuracy. 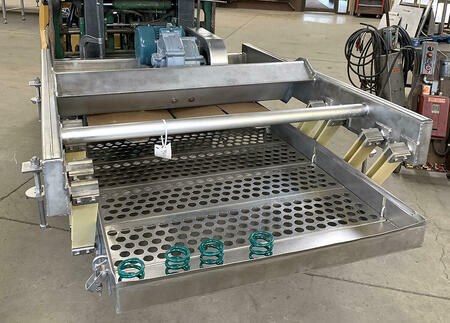 8 inch wide by 4 inch long by 8.5 inch deep weigh- cell "weigh bucket" has a pneumatic-cylinder-operated bottom trap door that drops product when the preset weight is achieved. Product drops through a discharge funnel into whatever container is presented, while the weigh cell gate closes so the next cycle can begin immediately. 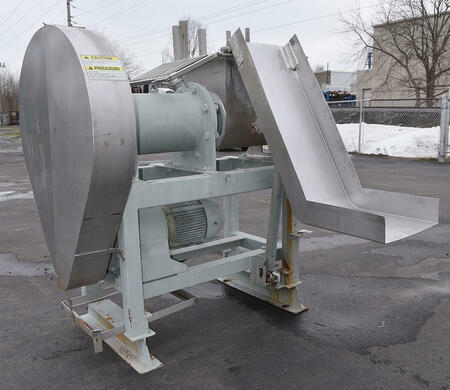 Standard discharge funnel tapers to a 2.25 inch square opening at a 33 inch discharge height -- other discharge funnels are available at a nominal cost. All product contacts are food grade sanitary stainless steel and the machine rests on a powder coated tubular steel support stand / frame. 110 volt single phase (household current) electrical input and 20 psi compressed air is required to operate the weigh cell discharge. NEW! Includes one (1) year manufacturer warranty. 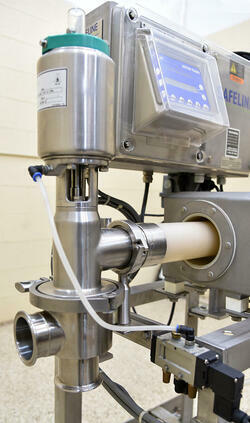 As of this writing, this semi-automatic filling machine is in stock NEW for immediate shipment. CALL 315-589-4511 to confirm availability and discuss your food packaging needs. Manufacturer rated for up to 550 inches per minute on up to 10 mil thicknesses. Flat seal -- specify 3/8 inch or 3/4 inch. Specify feed direction (left to right or right to left). Standard adjustable height stand is mild steel with USDA approved paint. Stainless steel top and side shrouding. Maintenance on this machine is designed to be user friendly. Sealing band change can be made in minutes without tools due to tilt-away drive system (no tools required band change a standard feature). If required, replacement of the temperature controller is snap-in, snap-out with no disconnecting or reconnecting of wiring necessary. 110 volt single phase electrical input. Stainless steel adjustable height stand (shown in video). Corrosion resistant stainless steel bottom plates (machine in video has). Casters for portability (shown in video). Bag trimmer (with or without vacuum). Coder options available, ink or embossing. 220 volt single phase electrical input option available. Crimper seal to make a checkered seal impression which adds a nice cosmetic appearance on clear polypropylene materials. Bag-holding conveyor option available, with or without slave speed synchronization, for sealing heavier bags. As of this writing, this NEW Packrite 6000 continuous-flow bag-sealing machine is USUALLY in stock at ALARD and available for timely shipment. Root Crops (potatoes, carrots, beets, etc): up to: 66 lbs (33 kg) per batch with an hourly throughput of 1,760 lbs (800 kg). Onions: 55 lbs (20 kg) per batch with an hourly throughput of 1,320 lbs (600 kg). Garlic: 44 lbs(20 kg) per batch with an hourly throughput of 1,100 lbs (500kg). Peeling chamber measures 21.5 inch diameter by 14.5 inch deep with abrasive side panel and rotating abrasive bottom disk. Side panel and bottom disk inserts can be changed depending on the product and type peeling desired. Water spray system assists with washing and removing peels. Finished product is discharged thru a 10 inch diameter door with chute. Peels, debris & water have their own separate side discharge. Hinged top cover with clear plexiglass center and safety interlock switch. Equipped with start/stop controls and 6 minute timer. Comes with three (3) interchangeable abrasive side panel peeling inserts and one (1) smooth insert designed for gentle washing. As of this writing, this peeler is in stock at ALARD, in EXCELLENT operational, mechanical, electrical and cosmetic condition, ready to go and available for immediate shipment. CALL 315-589-4511 to confirm availability and discuss your food processing needs. A Key Iso-Flo vibrating shaker with quickly interchangeable screen for grading, size sorting, fines removal, grading out shorts, solids separation, dewatering, and even-feeding to downstream components. 34 inch wide by 4 foot long shaker bed. 6 inch long smooth infeed. 36 inch long screen with 1-1/8 inch diameter perforations and quick release screen-retainer hooks for fast screen replacement / changeover. 6 inch long smooth discharge lip. Solid discharge pan for separation of graded materials. Ajax eccentric with 1HP drive. As of this writing, this vibratory grader is in stock at ALARD, in EXCELLENT mechanical & cosmetic condition, available for immediate shipment. CALL 315-589-4511 to confirm availability and discuss your industrial food process grading equipment needs. WEILER Model 1612B BLOCK GRINDER, 150HP. The Weiler 1612 meat grinder is manufacturer recommended to deliver premium quality product for a wide range of mid to high volume grinding applications from input in frozen block, tempered block, pre-broken frozen and rendering applications. 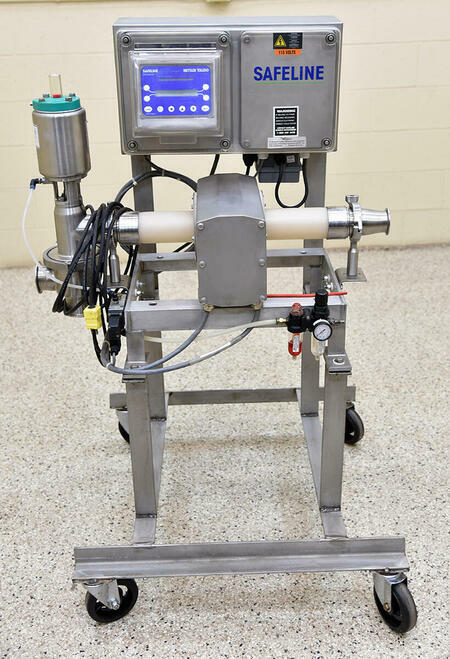 Delivers coarse grinds at exceptional throughput rates for ground, formed and portioned products, sausages, protein alternatives, pet food, pet treats, and pharmaceutical products, including beef, pork, poultry, veal, bones, fat, fruit, mutton, seafood, vegetables and other products. 38 inch by 34 inch by 24 inch deep reversible block feed hopper with stainless steel safety grid. 32 inch long by 21 inch wide grinder feed trough. Straight fluted head with 110-050983SS auger. 16" diameter grinding disk, with cross-bridge grinder ring. Model FP1000 Screw trolley unloader and grinder ring holder. Manufacturer rated for products up to 24,000 pounds (10,886 kilograms) per hour. Actual grind rate will depend reduction size, raw material raw material temperature and other factors. Food grade USDA sanitary stainless steel product contacts / construction. 150HP 3 phase drive, with Model 16123-5HC gearbox, multi-belt drive configuration. As of this writing, this Weiler 1612 meat block grinder is in stock at Alard in very good condition, available for immediate shipment. CALL 315-589-4511 to confirm availability, and to discuss your industrial meat grinding and process equipment needs. Has 2.5 inch diameter by 22 inch long anti-static UHMW plastic through-tube running through a 4 inch diameter by 6 inch long opening in the metal detection sensor-head. All USDA / 3A dairy-sanitary Tri-clamp inlet/outlet connections / fittings. NOTE: Pictures show the through-tube infeed necked down from a 2.5 inch Tri-Clamp connection / to a 2 inch Tri-Clamp connection. This reducer can be easily removed or utilized as desired. Pneumatic reject valve with 2.5 inch sanitary Tri-clamp fittings. Straight-through good product discharge, down-facing reject discharge. Frame-mounted, stainless steel control panel with digital touch-pad operator controls. Metal detection head, divert valve & control panel mounted together on a common stainless steel frame, on casters for portability; set for:110 volt single phase (standard household current) electrical input. 33" high infeed to center-of-pipe. 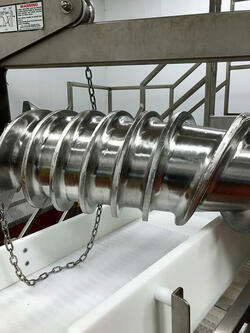 37 inch high straight-through good-product discharge from the reject valve. 31 inch high floor-facing rejected-product discharge. 110 volt single-hase (tandard household current) electrical input. Compressed air required for automatic reject valve. As of this writing, this industrial food process pipeline metal detector is in stock at ALARD, in EXCELLENT operational, electrical & cosmetic condition, available for immediate shipment. CALL 315-589-4511 to confirm availability and discuss your food process metal detection needs.